Just because you live in a fishbowl, doesn’t mean you can’t dream big! 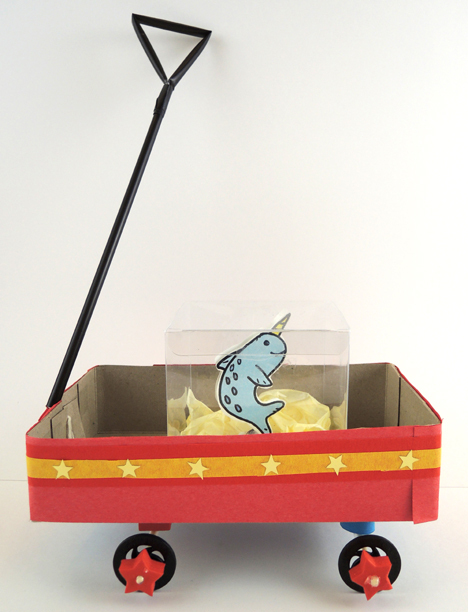 We made these adorable narwhal tanks, and then hit the road with a little red wagon so our aquatic friend could take in the sights and sounds of the wide, wonderful world! We read Someday, Narwhal, written by Lisa Mantchev, and illustrated by Hyewon Yum (Simon & Schuster, 2017). Narwhal lives an unexciting life inside her fishbowl. The view barely changes, even when she gazes at the blue sky outside the window. Narwhal dreams of seeing the world, but her lack of feet, concerns about getting lost, and fear of the cold keep her from venturing out. Happily, her friends (Boy, Bat, Penguin, and Giraffe) work together to take Narwhal on an unforgettable trip in a little red wagon. The world awaits! 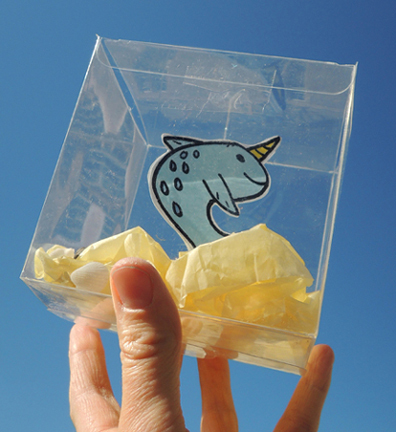 We used 4″ x 4″ x 4″ clear plastic favor boxes for our narwhal tanks (a 25 pack is currently $18 on Amazon). Place yellow tissue paper on the bottom of the tank, and add some (optional) mini sea shells. Now for the narwhal! It’s two sided, so color and cut both the right and the left-facing narwhal pieces from the template. Tape a 2.5″ piece of clear elastic beading cord to the back of the left narwhal, then tape the right narwhal on top of it. Measure for height and tape the free end of the clear beading cord to the top of the tank lid. Done! 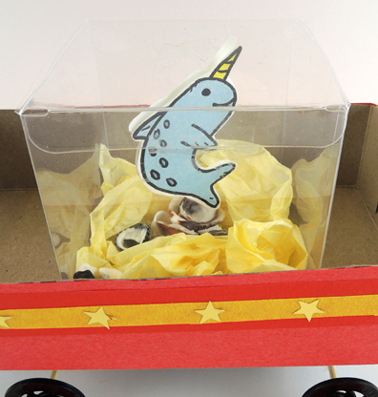 If you’d like to make this awesome tissue box wagon for your narwhal to ride in, you’ll find the instructions in this post. Then wheel your narwhal outside for a little walk! This entry was posted in Picture Book Projects and tagged activity, art, children, craft, craft project, fishbowl, friends, how to, Hyewon Yum, instructions, kids, library, Lisa Mantchev, literacy, narwhal, program, Someday Narwhal, story time, story time project, storytime, travel by Dana Sheridan. Bookmark the permalink.